Featured Project: From the ground up! The Toddler D class has been investigating different types of surfaces that cars and trucks drive on. They initially explored dirt roads and have been asking and discussing what is in and under the dirt. 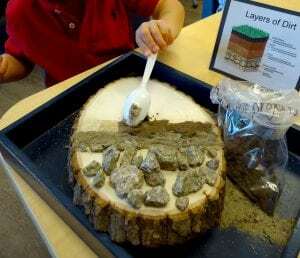 This led the class to create a representation of the different layers of the ground. 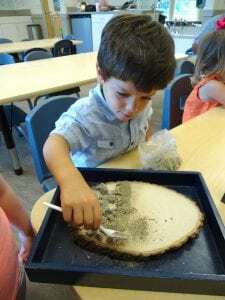 They began by going on a nature walk to collect material that makes up the main layers of dirt: rocks, sand, dirt and grass. Next, they assembled each layer by gluing them to the wooden slab to represent the five layers. It has been a fun and exciting process, exploring dirt and making our own representation to display!